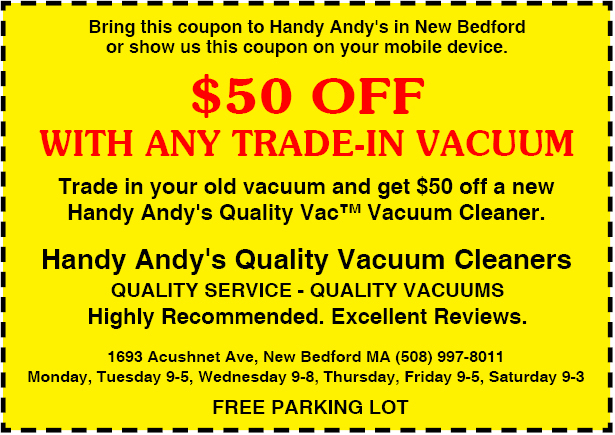 Handy Andy's Quality Vacuum Cleaners is located in New Bedford MA, at 1693 Acushnet Ave., just south of Nash Rd. Free parking in Handy Andy's Parking Lot adjacent to the building. Take 18 North onto Acushnet Ave. Go through the traffic lights at Coggeshall St. and then through the traffic lights at Sawyer St., and just before you reach the next traffic lights at Nash Rd. We are right there, turn left into Handy Andy's Parking Lot. Take 195 West to New Bedford. Take Exit 13B for 140 North. Take Exit 3 for Hathaway Rd. and turn left. Turn right at the second traffic light onto Nash Rd. Turn right at the third traffic light onto Acushnet Ave. We are right there, turn right after the building into Handy Andy's Parking Lot. Take 195 East to New Bedford. Take Exit 13B for 140 North. Take Exit 3 for Hathaway Rd. and turn left. Turn right at the second traffic light onto Nash Rd. Turn right at the third traffic light onto Acushnet Ave. We are right there, turn right after the building into Handy Andy's Parking Lot. Take 140 South to New Bedford. Take Exit 3 for Hathaway Rd. and turn left. Turn right at the second traffic light onto Nash Rd. Turn right at the third traffic light onto Acushnet Ave. We are right there, turn right after the building into Handy Andy's Parking Lot. Take 24 South toward Taunton. Take Exit 12 for 140 South to New Bedford. Take Exit 3 for Hathaway Rd. and turn left. Turn right at the second traffic light onto Nash Rd. Turn right at the third traffic light onto Acushnet Ave. We are right there, turn right after the building into Handy Andy's Parking Lot. Take 58 South toward West Wareham. Take Exit for 495 South. Take Exit 1 for 195 West to New Bedford. Take Exit 13B for 140 North. Take Exit 3 for Hathaway Rd. and turn left. Turn right at the second traffic light onto Nash Rd. Turn right at the third traffic light onto Acushnet Ave. We are right there, turn right after the building into Handy Andy's Parking Lot. Take 24 North toward Fall River. Take 195 East to New Bedford. Take Exit 13B for 140 North toward Taunton. Take Exit 3 for Hathaway Rd. and turn left. Turn right at the second traffic light onto Nash Rd. Turn right at the third traffic light onto Acushnet Ave. We are right there, turn right after the building into Handy Andy's Parking Lot. Take 123 North toward Norton. Take 495 South toward Taunton. Take Exit 7B for 24 South toward Fall River. Take Exit 12 for 140 South to New Bedford. Take Exit 3 for Hathaway Rd. and turn left. Turn right at the second traffic light onto Nash Rd. 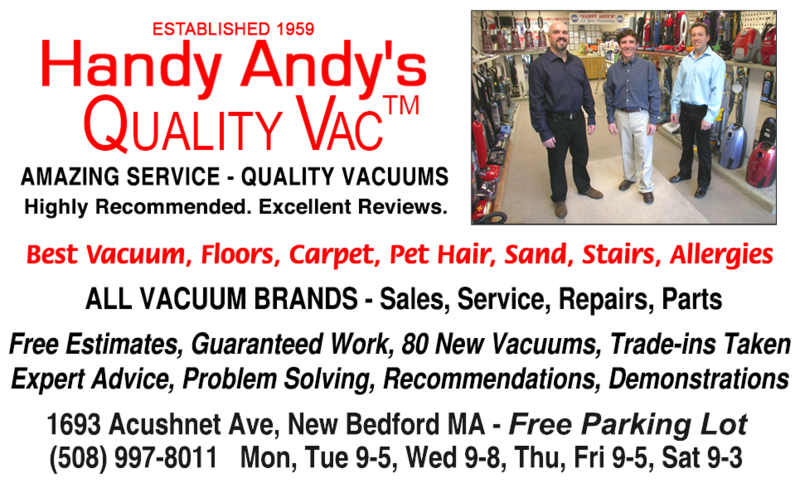 Turn right at the third traffic light onto Acushnet Ave. We are right there, turn right after the building into Handy Andy's Parking Lot.